Most WOC broadcasts since 2006 and several World Cup broadcasts the last years have been analyzed briefly, and key elements have been extracted from them. More information about how the broadcast analysis has been made here. WOC 2010. Produced by Kruuva/Olli Härkki. Approximately 16-18 cameras were in use, one separate OB-bus was linked to arena, and at least 50 GPSs were used with GPSseuranta. WOC 1997. An edited TV program made, but not sent. WOC 1999. No TV production. WOC 2001. Produced by YLE. First WOC with GPS-tracking, but not used in broadcast. 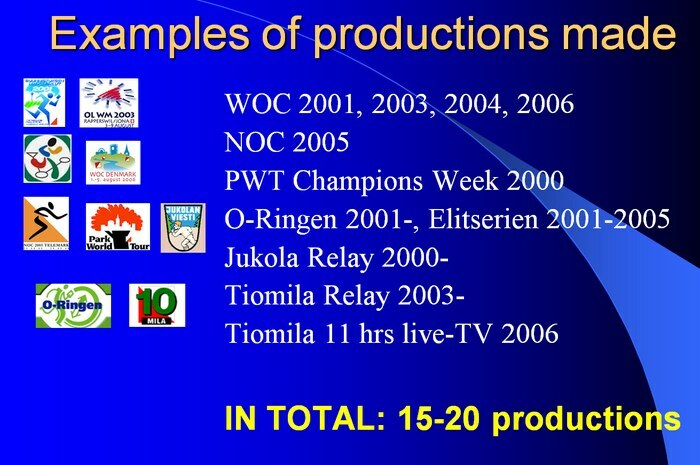 WOC 2003 Produced by Swiss TV? Very important - a leader’s chair is needed - important to show emotions / drama. This must be close to the run-in, and competitors must be informed about it. Comment: TracTrac already has split times in the system. This can be used to give alarms etc. General agreement that the look and feel of the start- and finish-area is very important. Important for the reputation of the sport. Must look like a Cross Country World Cup race – A-class. In the finish, nobody must run to the competitor to get the chip – it destroys the TV-pictures. 2. Last competitors is a looser: No way to show interesting stuff. You have 1 minute between each finisher. This can be filled with slow-mo and GPS-analysis / other analysis. Split time graphics: Same principle as in Cross Country Skiing, but own layout. Corporate layout to give professional look of the sport. Splits on every control: Not ripe for TV-productions yet. Use only for crew at first. Big potential for the relay. Who is dropping out of leading group etc.